2018's already seen a series of landmark releases from Technique Recordings, including No Concept's “Weirdo” featuring D12's Bizarre, their always-heavyweight summer compilation, and the monumental “Technique Goes to Let it Roll” EP. But, now, there's yet another twist to the tale with “Back to the Beat Volume 1”. This releases compiles two tracks from artists fresh to the label. 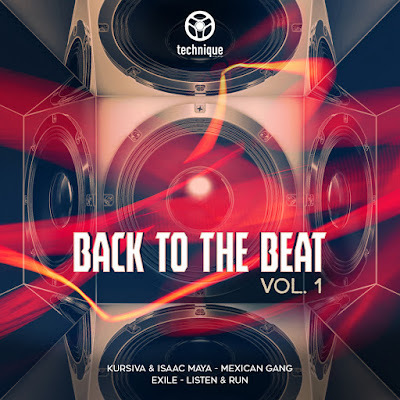 A string of big tunes, A-lister deejay support, and some powerhouse collaborations mean that the names Kursiva, Isaac Maya, and Exile will already be familiar to real DnB heads though. Opening proceedings, “Mexican Gang” sees the collision of Kursiva and Isaac Maya's tech and jungle influences. And they've spawned a monster. From the first G-funk broken piano chords, moving through the gorgeous licks of Spanish guitar, the deft musicality shines through. And then the devastating scythe of bass drops to provide a savagely raw counterpoint. Simultaneously melodic and vicious, this is a tune that's going to find a home in discerning selectors' sets from all corners of the scene. Then, Exile comes through with “Listen & Run”. There's no time wasted as we're thrown immediately into a dystopian soundscape, twisted and warped vocal samples melding with reconfigured percussion hits. Gut-churning low-end signals approaching menace, and, as the beat drops, the tune becomes an asylum of bassline madness. Ever-evolving bass modulations carve across the two-step beat, to create an elegant, neo-classic darkside roller. Everyone, whether jungle purist or jump-up skanker, is going to be feeling this one. So, this release showcases the sound of three DnB artists hitting their prime. We're hearing distinctive production voices paying homage to the foundations while still delivering ultra-contemporary dancefloor drum 'n' bass music. And, let's not forget, this is only Volume 1 of “Back to the Beat”. There are many more chapters of this story left to tell, and we can't wait to see what's coming.